Hello friends! I've got Home? Part 2 ready! *happy dance* I hope you like it! Thank you all for being so patient. I would have had it out yesterday but my computer deleted all the work I had done on it the day before :( If you missed the first part then here you go! Ok enjoy! I stood hidden behind a tall tree as I watched two other girls walk into the house where I was to live. "I wish I had the courage to do that," I thought sadly to myself. I turned and slowly slid my back down the tree as a question haunted my mind, "What if I get returned?" That terrible thought quickly shot fear up my spine. Just thinking of that horrid place made me want to cry, my whole life I had stared out the glass door of that cabinet. I was never touched by anyone, nor had my hair ever been lovingly brushed by a child.... Instead, I was displayed like a trophy. Never loved, just something to point at. The best thing they ever did for me was letting me go, I can't go back there... Never. Silent in my thoughts I sat behind the tree, when suddenly... "Hi there!" "AHHHH!" I screamed as I launched up to my feet so fast that my bag was thrown far in front of me. And standing before me was a girl, I think she was about my age, she had dark brown hair and brown eyes. The closer she came to me the more I nervously pushed myself back into the tree. She then grabbed my hand and started shaking it like the world was going to end. "Hi! I'm Samantha Parkington! But you can call me Samantha of course, or Sam, you can call me Sam too," She said to me rather quickly. "What on earth is she saying?" I wondered to myself, "She most definitely didn't speak Spanish. Was Samantha her name perhaps?" "Oh my gosh you're new here too!" She exclaimed as I stared, puzzled by what she was trying to tell me. She quickly snatched up my bag and said, "Come on! We can go in together, that would be so fun!" I was then more or less dragged towards the house. The closer I got, the more fear creeped through me.... "Why am I so afraid?" I asked myself. 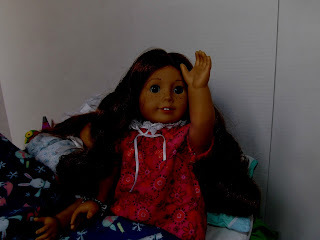 "I finally have a home where I can explore life... Sure I didn't expect there to be another doll, but as far as I can tell she seems nice, and maybe when we can actually understand each other. We'll be friends!" But deep down I knew exactly why I was afraid, I was afraid of this world that I knew nothing about, the world that I could only see through a glass door. We came to huge steps, I slowly made my way up, while Samantha swiftly concurred the steps and ran to the door. But as soon as I got to the top I froze, with my eyes locked on the door. "Dear Samantha and Josefina, I'm working on some things right now, so go ahead and show yourselves in. I'll come and hangout with you when I'm done." "Your name must be Josefina then!" She shouted from the door, "Come on, it says we can go in!" But I didn't understand, I just stared at her. When I didn't respond she came over and took my hand and said, "Come on, we just need to push the door open." I was then pulled to the door, knowing that this was it, this was the moment I would enter my new home. We came through the door into a large room with human sized furniture, but saw no humans. "Wow! Look at this place!" Samantha exclaimed as she pushed the door closed. "Everything is so huge! 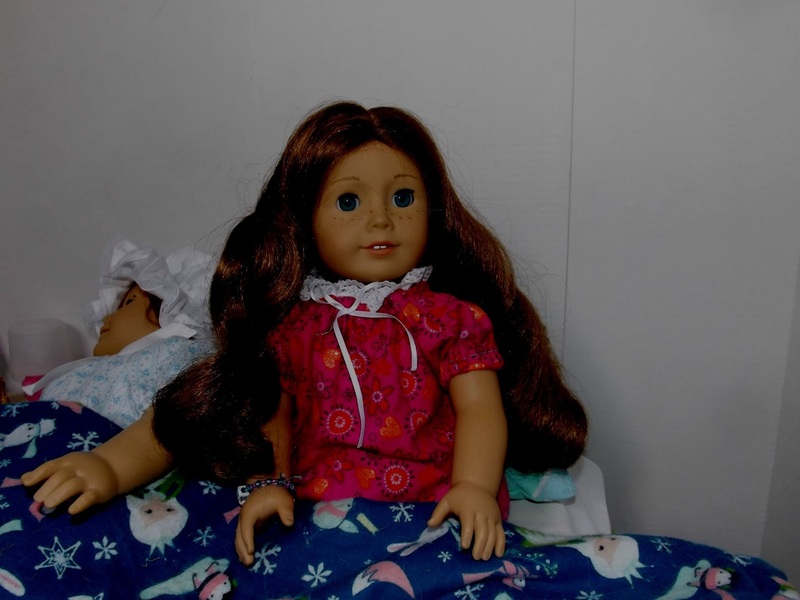 I can't wait to jump on the coaches and slide down the stair rails and-"
Samantha was suddenly interrupted when a flood of loud dolls came blowing towards us. "Oh my gosh Josefina" Samantha said as she shook me by the shoulder, "That's them, that's our family!" And it seemed like only a few seconds later that she was embraced and accepted by the others. While I cowered against the wall, terrified by the large crowd. I realized that it was not only Samantha who didn't speak Spanish, but none of them spoke Spanish. I must have caught her eye because she suddenly came running towards me. "Oh my gosh! And you're here too!" She exclaimed as I franticly tried to move away. But before I could get every far she threw her arms around me and shouted, "I'm so glad you made it!" I was so overwhelmed by everything, so much that I didn't understand. I could suddenly feel silent tears streaming down my face. Just when I thought I couldn't take it any longer, another doll pulled her away from me. "Molly! Didn't we literally just go through the "Let's not be overwhelming thing" just a few minutes ago?!" She yelled at her in frustration. "I'm sorry, she's crazy," the girl with strawberry blonde hair told me. "Hey!" The other girl protested, "I highly disagree with that statement!" Still in tears I turned away, covering my face with my rebozo, in hopes that no one would notice. "She didn't mean to scare you, she was just excited." "Woah, guys stop!" Someone said, I turned and realized that it was Katie, my new owner. "I'm so sorry Katie! I didn't mean to freak her out so much, I guess sometimes it's just hard to contain all this awesomeness," said the one who I think was named Molly. "Guys," Katie said softly, "Josefina doesn't speak English." "What?" Both Molly and the other girl said in almost a whisper. "It's going to take time," Katie told them all, "We're all going to have to learn and work together, but right now I think Josefina needs a little time to herself,"
"Maryellen, could you take Josefina to the room she and Samantha are going to share please?" she asked as she gently led me to her. So Maryellen then walked me through the crowd of eyes that stared at me, while I looked away, embarrassed for showing such emotion. I stood awkwardly by the dresser of my new bedroom in the late hours of night. 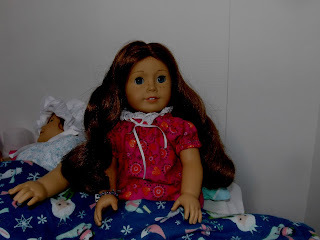 While Josefina sat quietly on the bed. I came in shortly after Josefina did, but all she's done is sit there and avoided looking at me. "She's probably mad at me," I thought to myself, "And I couldn't blame her." You see, my old owner donated me to a thrift store a long time ago, I was there found by a couple who just wanted to make a profit off me, so I was put on Ebay and bought shortly afterwards, only to be returned as soon as I arrived. It's so devastating to be sent back like that, being adopted to this home means the world to me. I never realized Josefina was as afraid as she was, and I just threw her into everything without even thinking about it. I seem to do that a lot. I get so caught up in my feelings and imagination that I don't always see how others feel. 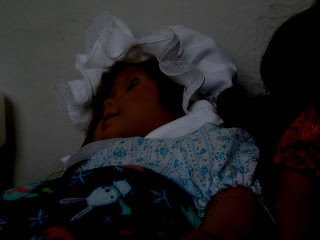 I glanced over at Josefina and saw she was holding a small doll. "Oh my gosh! 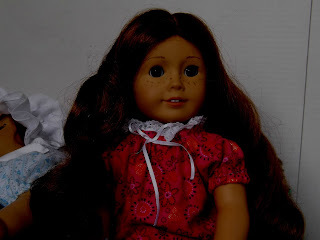 What a pretty doll!" I exclaimed, catching her by surprise. Then returned as fast as I had left. 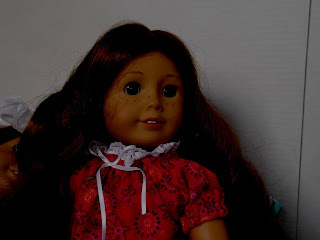 "This is my doll, Lynda," I explained to her, "I got her when I-"
I suddenly paused when I noticed her blank expression staring back at me, she didn't understand. At a loss for what to do, I just gave an uncomfortable smile, then turned to put Lynda back were she was once before. As I set my doll in her place I heard a small voice say something, "D-doll?" And to my surprise I saw Josefina sliding herself off the bed. 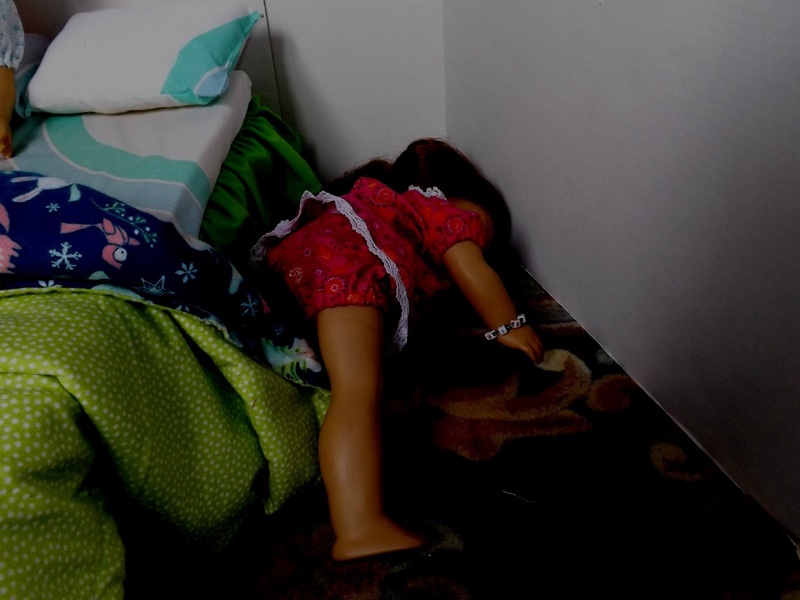 She slowly walked closer, and while reaching her doll out towards me she said, "doll?" I was stunned! Oh, my gosh, she trying to speak English! "Yes! Oh my gosh you've got it!" "Oh wait, uhhh, I can get this........See?" A huge smile grew across her face as she replied, "Si!" "She's not mad at me after all!" The thought happily skipped through my mind. I was so excited that I embraced her in a hug, and to my surprise, she hugged me back. Afterwards we just stood there for a moment, both kind of in the shock of what had happened. When a thought suddenly came to me. "Wait a second," The words escaped my lips. I reached around for Lynda, then turned to Josefina, "I think I have an idea...."
But noooo, not I. Well the truth was that I couldn't sleep. I kept thinking about Josefina. It's really scary going to a new home, and I can't even imagine how much harder it would be if you didn't speak the same language as your new family. I wanted to do something to help her, but nothing seemed like it would work. "Oh what's the use!" I thought as I tiredly rubbed my eyes, "How could I possibly help when we don't even understand each other." "If only I could speak Spanish, but there's no way I could learn fast enough." My mind raced in circles, but got nowhere. I was just about to give up, when suddenly..."Hey Saige?" But got tangled in the blankets, soon finding myself falling on the floor. Felicity flipped the light switch, then looked to me and asked, "Do you normally get spooked so easily?" "I was not spooked!" I shot back in protest, "I'm just..... A very cautious person! When you hear a voice piercing through the night it's usually a good idea to get away from it!" She simply rolled her eyes and said, "Uh yeah, sure Saige...."
"Am I uh, keeping you up?" I asked when I finally got to my feet. "Nope, couldn't sleep, you thinking about Josefina too?" "I want to do something to make her feel better, but there's literally nothing I can do," I began to blurt out to her. "I mean, English is hard enough! The only words I know in Spanish are taco, uno, and lune!" "Lune's French," Felicity corrected me. "See?! UGGGGH!!" I groaned before dramatically throwing my face onto the bed. "And who said we couldn't do anything?" I heard Felicity say. I looked up at her to see a mischievous grin spread across her face, which made me nervous, but I was desperate....... and tired. I slid myself onto the bed, and leaning forward I asked, "What's your plan?" "Oh me? I've got nothing." She said in a way that made my heart sink. "But, I don't think we have to speak the same language to do something nice for her." She then continued. "Come on," Felicity said as she got out of bed. "Let's get something to drink and we'll talk about it and see what we can come up with." So down the dark and quiet hallway, I followed her, then when we reached the kitchen she suddenly stopped. We could see the light shining from the front room. And there on the coach was Kirsten, at least I hoped that was Kirsten... I started getting confused after being told the tenth name. She sat clinching tightly to her doll, looking as if she had been crying. She didn't notice us, her gaze was focused in the other direction. After exchanging a silent glance, me and Felicity slowly approached, "Hi Kirsten." With a small jump, her head shot around to meet our eyes. "Oh, hi guys," Kirsten said, slightly shaken, "what are you doing up at this hour?" "I could ask you the same thing..." I replied as sat myself next to her. "Oh, yeah.... Well, I uh, couldn't sleep." She told us nervously. "I see.." I replied, I knew something was wrong, so as I scooted closer to her so Felicity could sit down I asked, "Is something wrong?" "No," She answered rather unconvincingly. I placed my hand softly on Kirsten's shoulder, "It's ok Kirsten," I said gently, "you can talk to us." "I-I... I'm scared you won't want to stay here!" Kirsten began to cry, "I'm afraid that you and Josefina don't like it here and you won't want to live here!" I was horrified! "Kirsten why on earth would you think that?" "both of you are avoiding us, and I thought you didn't like us," Kirsten confessed. "No Kirsten," I almost whispered to her, "Josefina is just afraid.... And so am I." Kirsten slowly turned her teary eyes until they met mine. I took a deep breath, and let the story I'd been holding in escape, "My old family, I was the oldest of three dolls. Our owner is 17 now, and she didn't care about us anymore, so we just sat on the shelf in the closet for years. One night we could hear our owner talking to her mom about what stuff she would like to sell on Ebay to make money for college... and we were on the list. My sisters were terrified, they asked me if we would get separated, I promised them I wouldn't let that happen. "The next day she pulled us off the shelf to take description pictures, and before long I had been bought. As I walked to the door with my owner, Jennie, my sister, ran after me. In tears she hugged me and begged me not to leave them, and with all my heart I wanted to, but my owner ripped me away. On the ride to drop me off, I heard both of my sisters had been bought, but they weren't going to the same home." "I couldn't keep my family, and now I'll never see them again, and I'm afraid that if I mess up here I'll lose this family too"
We all fell into a dead silence for a moment. Until Kirsten tightly wrapped her arms around me, "I'm so sorry that happened Saige," Kirsten said sincerely. "But we'll always love you, you don't have to worry about messing up." "Thanks Kirsten," I smiled as my heart felt relief. Felicity kindly tapped my shoulder, I turned to her and she whispered, "Love you sis." "This is where I belong," I thought, "This is my family." Then all the sudden, it hit me. "Oh my gosh!" I exclaim in excitement, "I know how to make Josefina feel welcome!" "Oh my goodness really?" Kirsten said as she threw her arms in the air, "What is it?" I leaned over and quietly whispered my idea into her ear. She smiled brightly and replied, "That's an awesome idea Saige! I'll go get the others and then we can get to work." And without hesitation she was off to awaken the others. "Come on," I said as I took Felicity by the wrist. "Uh, Ok?" She replied as I pulled her along, "Where are we going?" Once we reached the laundry room I began to urgently dig through my backpack in search of my paintbrushes. "Saige, what's the plan?!" She said, probably getting annoyed with me for not answering her questions. "We're going to work together to do something special for Josie. Now, I have a question for you, how do you feel about all nighters?" "I can stay up longer than you," She responded with her eyes full of competitiveness. I paced back and forth in the early morning light that shined through the window. My hands shook nervously as I rehearsed the words that Samantha and I had practiced with our dolls the night before. "Please don't mix the words up," The thought repeated through my mind. A gentle pat on my back caused me to look behind me, it wasn't long before I realized it was Samantha. "Don't worry Josie," she told me, "I know you can do this." I smiled warmly at my new friend, I didn't know what she was telling me, but now I know that she means well, and that she was really a kind person. She walked over to the door and pointed at it, I instantly knew she was asking if I was ready to go. I slowly nodded before following her into the warm hallway. When we reached the kitchen I froze, I almost couldn't believe what I saw. The sound I had heard in the hall was my favorite song in my language, and Molly was even watching a video and learning a traditional Spanish dance. A sigh that said welcome was spread across the wall in the living room. And even a beautiful hand painted painting was hung on the wall. It said live life beautiful in Spanish. "Wow, that is so amazing Josefina," Samantha gasped. My eyes filled with tears "Wow, they did all of this.... For me." I thought to myself. "Ahem," I hear the noise come from behind me, I turned to see my sisters all lined up together. One began to walk forward, she looked back nervously at the others, but they motioned her to keep going. Then while carefully holding out a plate to me she said, "Hola mi nombre es Kristen, te hicimos tortillas y estamos tan emocionados que serás nuestra Hermana." My heart leaped, I couldn't believe it, she was trying to speak Spanish! "Muchas gracias!" I replied, as I took the plate. "Hopefully those ones taste ok," Molly randomly said, "because the first batch we made was TERRIBLE!" But she was quickly silenced by Saige elbowing her in the chest. Her fingers swiftly placed beaded bracelets around our wrists. "They have our names on them! Thanks so much Avery!" Samantha exclaimed. I smiled at Avery, as to tell her thank you, then looked over at Sam, she knew I was ready, and nodded in approval. So I walked to the center of the room. My sharp whistle immediately got the attention of the others. Then prepared to say the words Sam helped me translate to English. "Hello, I'm Josefina, I'm so excited to be apart of your family, thanks for letting me be your new sister." The awes and happy tears ran rapidly through the room thereafter, and my sisters began to hug me and each other. I love this family I finally have, sure we're all about as different and as quirky as can be.. But I love them, and they love me, and we'll always be there for each other no matter what. Yay! 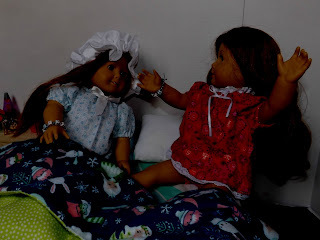 we're all so excited to have welcomed the new dollies into the All Doll'd Up family :) Ok so just in case you're wondering Saige and Felicity were Christmas gifts, Samantha I bought with my Christmas money, and Josefina was a birthday gift *Note: Once again in no way am I trying to brag. I'm very thankful for the dolls I have* I'll have their profiles up soon as I can! Who is your favorite out of the new dolls? I'd love to know, let me know in the comments :) Have a wonderful day! Congrats, Katie! 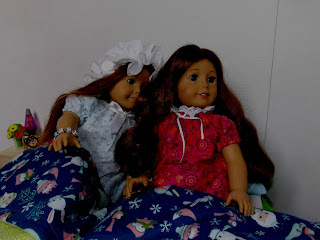 your new dolls are beautiful and this photo story was really sweet! Awww, me too <3 thanks for commenting!